Wildly theatrical, wickedly comic and wonderfully powerful, Medea/Macbeth/Cinderella takes three classic plays and juxtaposes and interweaves them to dramatic effect. It was originally conceived by Bill Rauch, and remains the most challenging choreographic assignment I have ever had in the theater. 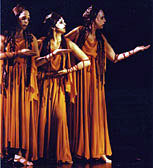 These photos are from its incarnation at Yale Rep. 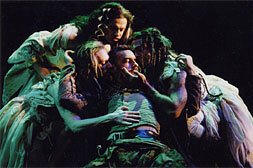 Learn about the most recent production of Medea/Macbeth/Cinderella at Oregon Shakespeare Festival. 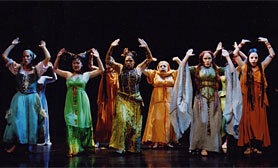 A videotape of Medea/Macbeth/Cinderella can be viewed at the Lincoln Center Library of Performing Arts in New York City. To make a viewing appointment, call the Theater on Film and Tape Archive at 212-870-1642. "Extraordinary... category-defying... pure theatricality... floats on wings of song and dance... a smashing opener for James Bundy's first season as Yale Rep's new artistic director." "Sabrina Peck is an artist of infectious charm and rare intelligence. I have only known her to elevate the work of her collaborators by running with the best ideas, letting the bad ones fall of their own weight, and improving those in between. She is one of a handful of choreographers, in my experience, who have found consistently original and compelling modes of staging for music theatre."